Outdoor wireless design can be very complicated. Should you use wireless mesh or antenna arrays? How do you integrate your outdoor wireless system with the indoor wireless system for handoff and performance? Should you use directional antennas or Omni-directional antennas? Do you need point to point bridges across campus? How do you plan for use of hand held devices or wireless VoIP phones outside? ….And on and on...There’s a lot to consider. Certainly starting with what devices and applications you want to run on your wireless infrastructure is important. But for some reason when someone says “outdoor coverage” IT Directors everywhere starting thinking about mounting access points on light poles, using solar panels and buying hardened outdoor mesh access points or antenna arrays. In our early days, we did the same thing. But before you order those solar panels or climb a light pole consider this: In all of the large wireless deployments we’ve done including college campuses, K-12 schools, hospital wireless, and even large municipal airports we’ve needed to use wireless mesh and outdoor access points in less than 10% of the outdoor wireless coverage we've deployed. The reason is simple, in almost all of the cases customers want coverage in areas that are within range of buildings. Even wireless coverage for sports fields for example, usually has a clubhouse with network connectivity close by. 1) Use Wireless Mesh only when you have to: Wireless Mesh means that you have no network connectivity to that access point location and the wireless system uses radios to repeat the wireless signal. This is called a “hop”. The challenge with this is that Mesh has to cut the bandwidth in half for each “hop” you create. Need to hop three light poles to get across a large sports field? You just cut the bandwidth from 300 Mbps (using 802.11n 2X2 MIMO) down to 37.5 Mbps…more than an 85% chop in bandwidth available to use. 2) Use indoor access points with outdoor antennas: Outdoor antenna arrays and outdoor access points cost 3-5X that of indoor access points with an outdoor antenna. To restate above, 90% of the time customers want wireless coverage for areas close to buildings (sports fields, courtyards, outside jet bridges, etc.). Instead of mounting access points on light poles, mount an indoor access point inside the building. Use an AP that allows for external antennas. Use a low DB loss antenna cable to extend the antenna outside the building, and then select the proper outdoor antenna to cover the outdoor area needed. This will save significantly on the cost, and is much easier to deploy than solar panels and aps on light poles. 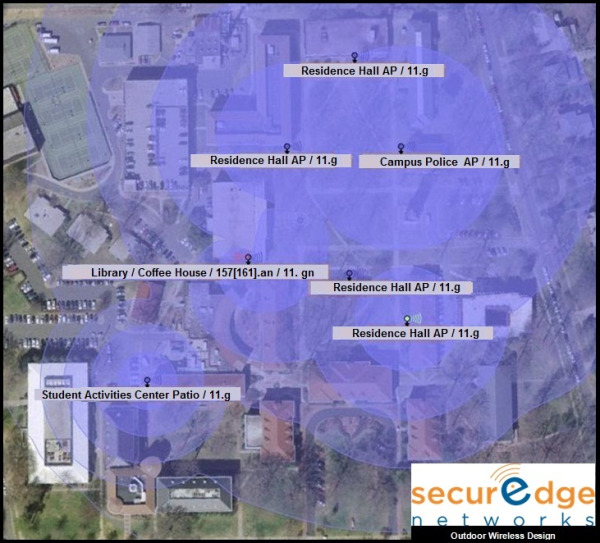 The picture above is a live coverage map of the outdoor portion of a campus wifi network we deployed, all in the manner described here. Of course we always recommend getting a wireless consultant to help with outdoor wireless design and deployment. 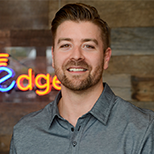 There are a lot of things you need to consider, but these are two tips that have saved our customers money, increased bandwidth and simplified deployments. If we can be of assistance to you or if you have any additional comments or questions feel free to contact us or make a comment below.